Recent sector survey results tell the story of a sector that has not internalized diversity in its hiring policies. In this Sector Signal, we analyze the findings from the Looking Ahead Leadership Survey and consider the challenges facing the sector in advancing diversity and inclusion. What does it mean when the majority of organizations in the sector are not deliberately pursuing diversity in their recruitment practices? What are the challenges that limit the sector from advancing diversity and inclusion as a strategic priority? We also explore the core elements of diversity’s value proposition in the not-for-profit sector and make recommendations regarding how to move the marker on diversity and inclusion meaningfully across the sector. What is the broader value proposition for diversity in the not-for-profit sector, beyond social justice and equity, and how can it be leveraged to contribute to organizational success? Going forward, how can diversity and inclusion be better supported and advanced across the sector? Diversity and inclusion have been emerging as organizational values and priorities in workplaces across sectors and industries for a number of decades, often as part of a broader conversation about innovation, productivity and prosperity. As a country influenced largely by immigration, with cities that are among the world’s most diverse, Canada is well-positioned to be a leader at understanding and leveraging diversity as a strategic advantage. Inclusive practices and cultures can support diverse communities and workplaces and enhance the potential benefit of diversity, but the foundation for all of this requires recognition of diversity as a valued asset. Based on recent survey findings, the not-for-profit sector in Ontario does not appear to be diverse in its leadership, or to have a strong commitment to diversity and inclusion at the organizational level. For many in the sector, this is not news. Although many organizations in the sector may have a strong ethos around equity and inclusion, this does not necessarily translate into organizational practice. The absence of systems regarding diversity and inclusion should certainly signal the need for change in a sector that aspires to represent and speak for the community, with missions that often include creating community benefit and value. 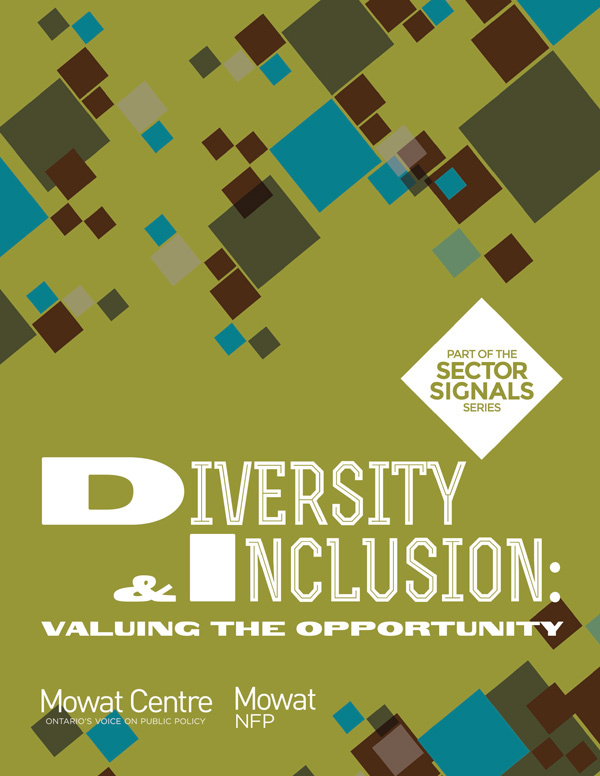 This Sector Signal asks a number of questions about diversity and inclusion in the sector. What does it mean when the majority of organizations in the sector are not deliberately pursuing diversity in their recruitment practices? What are the challenges that limit the sector from advancing diversity and inclusion as a strategic priority? What is the broader value proposition for diversity in the not-for-profit sector, beyond social justice and equity, and how can it be leveraged to contribute to organizational success? Going forward, how can diversity and inclusion be better supported and advanced across the sector?